It was like many Maui mornings, the sun rising over Haleakala as we greeted our divers for the day's charter. As my captain and I explained the dive procedures, I noticed the wind line moving into Molokini, a small, crescent-shaped island that harbors a large reef. I slid through the briefing, then prompted my divers to gear up, careful to do everything right so the divers would feel confident with me, the dive leader. The dive went pretty close to how I had briefed it: The garden eels performed their underwater ballet, the parrot fish grazed on the coral, and the ever-elusive male flame wrasse flared their colours to defend their territory. Near the last level of the dive, two couples in my group signalled they were going to ascend. As luck would have it, the remaining divers were two European brothers, who were obviously troubled by the idea of a 'woman' dive master and had ignored me for the entire dive. The three of us caught the current and drifted along the outside of the reef, slowly beginning our ascent until, far below, some thing caught my eye. After a few moments, I made out the white shoulder patches of a manta ray in about one hundred and twenty feet of water. Manta rays are one of my greatest loves, but very little is known about them. They feed on plankton, which makes them more delicate than an aquarium can handle. They travel the oceans and are therefore a mystery. 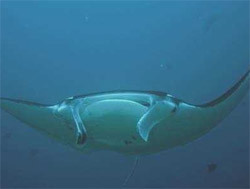 Mantas can be identified by the distinctive pattern on their belly, with no two rays alike. In 1992, I had been identifying the manta rays that were seen at Molokini and found that some were known, but many more were sighted only once, and then gone. So there I was... a beautiful, very large ray beneath me and my sceptical divers behind. I reminded myself that I was still trying to win their confidence, and a bounce to see this manta wouldn't help my case. So I started calling through my regulator, "Hey . . come up and see me !" I had tried this before to attract the attention of whales and dolphins, who are very chatty under water and will come sometimes just to see what the noise is about. My divers were just as puzzled by my actions, but continued to try to ignore me. There was another dive group ahead of us. The leader, who was a friend of mine and knew me to be fairly sane, stopped to see what I was doing. I kept calling to the ray, and when she shifted in the water column, I took that as a sign that she was curious. So I started waving my arms, calling her [ the manta ] up. After a minute, she lifted away from where she had been riding the current and began to make a wide circular glide until she was closer to me. I kept watching as she slowly moved back and forth, rising higher, until she was directly beneath the two Europeans and me. I looked at them and was pleased to see them smiling. Now they liked me. I could call up a manta ray. Looking back to the ray, I realized she was much bigger than what we were used to around Molokini - a good fifteen feet from wing tip to wing tip, and not a familiar-looking ray. I had not seen this animal before. There was something else odd about her. I just couldn't figure out what it was. Once my brain clicked in and I was able to concentrate, I saw deep V-shaped marks of her flesh missing from her backside. Other marks ran up and down her body. At first I thought a boat had hit her. As she came closer, now with only ten feet separating us, I realized what was wrong. She had fishing hooks embedded in her head by her eye, with very thick fishing line running to her tail. She had rolled with the line and was wrapped head to tail about five or six times. The line had torn into her body at the back. And those were the V-shaped chunks that were missing. I felt sick and, for a moment, paralyzed. I knew wild animals in pain would never tolerate a human to inflict more pain. But I had to do something. I forgot about my air, my divers and where I was. I went to the injured manta. I moved very slowly and talked to her the whole time, like she was one of the horses I had grown up with. When I touched her, her whole body quivered, like my horse would. I put both of my hands on her, then my entire body, talking to her the whole time. I knew that she could knock me off at any time with one flick of her great wing. When she had steadied, I took out the knife that I carry on my inflator hose and lifted one of the lines. It was tight and difficult to get my finger under, almost like a guitar string. She shook, which told me to be gentle. It was obvious that the slightest pressure was painful. As I cut through the first line, it pulled into her wounds. With one beat of her mighty wings, she dumped me and bolted away. I figured that she was gone and was amazed when she turned and came right back to me, gliding under my body. I went to work. She seemed to know it would hurt, and somehow, she also knew that I could help. Imagine the intelligence of that creature. To come to me for help. And to trust. I cut through one line and into the next until she had all she could take of me and would move away, only to return in a moment or two. I never chased her. I would never chase any animal. I never grabbed her. I allowed her to be in charge. And she always came back. When all the lines were cut on top, on her next pass, I went under her to pull the lines through the wounds at the back of her body. The tissue had started to grow around them, and they were difficult to get loose. I held myself against her body, with my hand on her lower jaw. She held as motionless as she could. When it was all-loose, I let her go and watched her swim in a circle. She could have gone then, and it would have all fallen away. She came back, and I went back on top of her. The fishing hooks were still in her. One hook was barely hanging on, which I removed easily. The other was buried by her eye at least two inches past its barb. Carefully, I began to take it out, hoping I wasn't damaging anything. She did open and close her eye while I worked on her, and finally, it was out. I held the hooks in one hand, while I gathered the fishing line in the other hand, my weight on the manta. I could have stayed there forever. I was totally oblivious to everything but that moment. I loved this manta. I was so moved that she would allow me to do this for her. But reality came screaming down on me. With my air running out, I reluctantly came to my senses. And I pushed away. At first, she stayed below me. And then, when she realized that she was free, she came to life like I never would have imagined she could. I thought she was sick and weak, since her mouth had been tied closed, and she hadn't been able to feed for however long the lines had been on her. I thought wrong. With two beats of those powerful wings, she rocketed along the wall of Molokini and then directly out to sea. I lost view of her and, remembering my divers, turned to look for them. Remarkably, we hadn't travelled very far. My divers were right above me and had witnessed the whole event, thankfully. No one would have believed me had I been alone. It seemed too amazing to have really happened. But as I looked at the hooks and line remaining in my hands and still felt the torn calluses from her rough skin, I knew that, yes, it really had happened. I kicked in the direction of my divers, whose eyes were still wide from the encounter, only to have them signal me to stop and turn around. Until this moment, the whole experience had been phenomenal, but I could explain it. Now, the moment turned magical. I turned and saw her slowly gliding toward me. With barely an effort, she approached me and stopped, her wing just touching my head. I looked into her round, dark eye, and she looked deeply into me. I felt a rush of something that so over-powered me; I have yet to find the words to describe it, except a warm and loving flow of energy from her into me. She stayed with me for a moment. I don't know if it was a second or an hour. Then she lifted her wing over my head . . and was gone.